Win medals based on your score through live online high scores for each event and location. 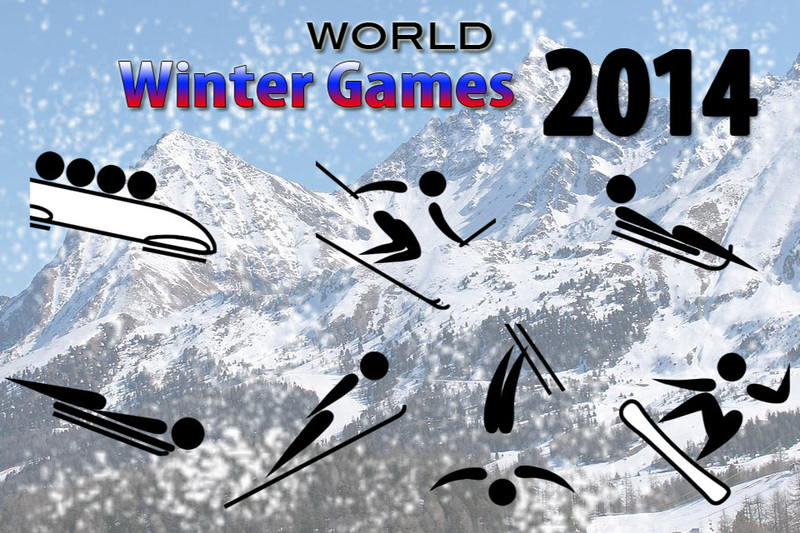 With World Winter Games 2014, you will feel like you really are competing in winter athletic events. 1) Home Button on the Right - turning the iPhone clockwise will cause a left hand wall, counter-clockwise will cause the sled to bank up the right hand wall. 2) Home button on the Left - turning the iPhone clockwise will cause the sled to bank up the right hand wall, counter-clockwise will cause the sled to bank up the left hand wall. 1) Home Button on the Right - turning the iPhone clockwise will you to move to the right, counter-clockwise will cause you to move to the left. 2) Home Button on the Right - turning the iPhone clockwise will you to move to the left, counter-clockwise will cause you to move to the right. Note: The clockwise and counter-clockwise motion, refers to lifting and lowering the left and right side of the iPhone, while in landscape mode. Home Button must be on the Right - turning the iPhone clockwise will you to move to the right, counter-clockwise will cause you to move to the left. To begin, tap the center of the iPhone in order to gain speed. Anticipate the turns as they appear. Continue to tap the center of the screen to pick up speed. Use the brake to slow down. Proceed to the Finish Line. To begin, tap the center of the iPhone in order to gain speed. Anticipate the turns as they appear. Continue to tap the center of the screen to pick up speed. Try to stay within the blue lines, you will be disqualified if you ski outside of the red gates. Proceed to the Finish Line. To begin, tap the center of the iPhone in order to gain speed. Anticipate the turns as they appear. Tap the center of the screen to pick up speed. You must ski to the right of the red flags, and to the left of the blue flags otherwise you will be disqualified. Proceed to the Finish Line. This event only works with the Home Button on the right. To begin, tap the center of the iPhone in order to gain speed. Continue to tap the center of the screen to pick up speed. 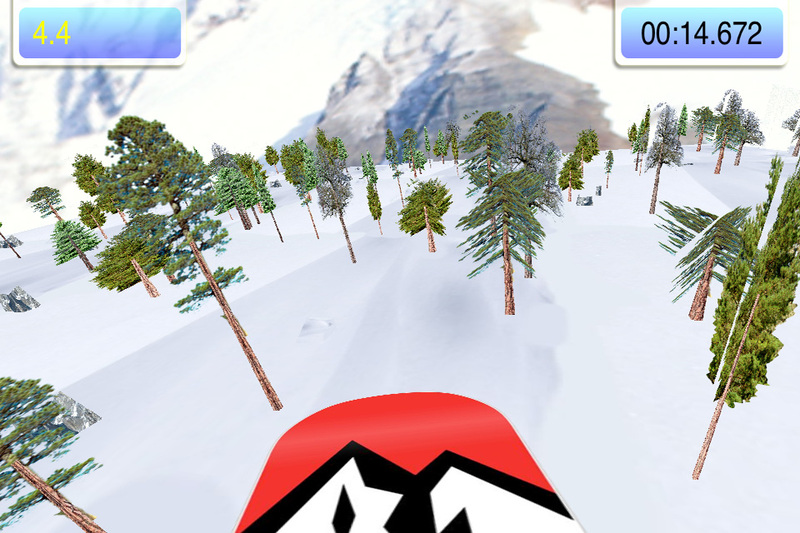 Once you reach the end of the ramp, tilt the iPhone to forward to minimize your drag. The lower your drag, the farther you will fly. However, if you lean to far forward, you will lose your balance and be disqualified due to injury. To begin, tap the center of the iPhone in order to gain speed. Continue to tap the center of the screen to pick up speed. 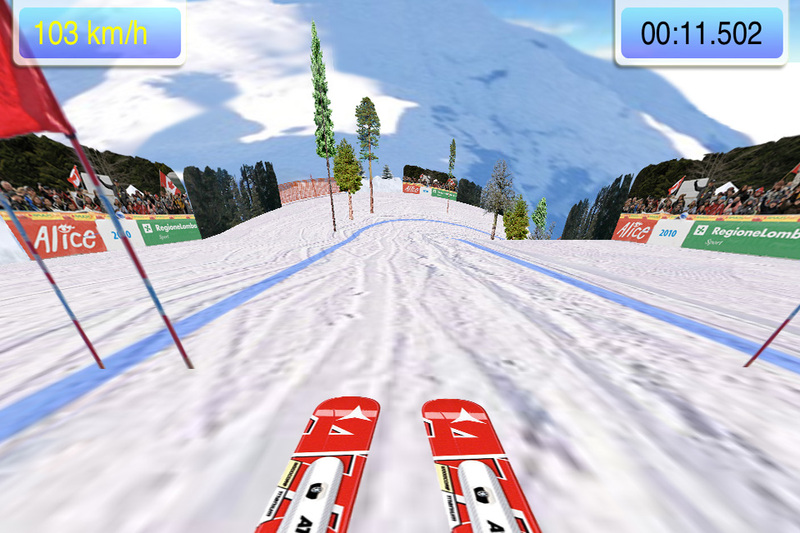 You are free to ski anywhere down the mountain, be careful of the trees, rocks, and cliffs. 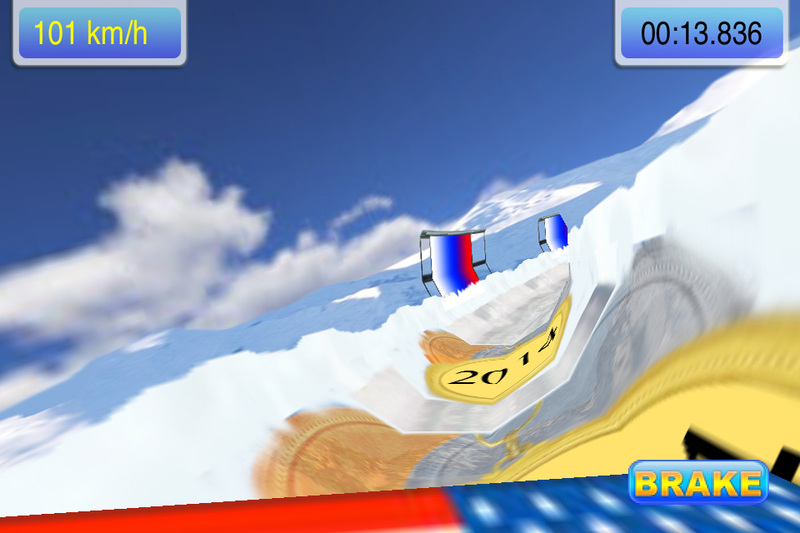 Your score is determined by how fast and how far you make it down the mountain.